I’m obsessed with projections in mid-air, ever since I first saw Princess Leia ‘so-called’ hologram, and I dreamed for years of having a go at Tom Cruise’s UX in minority report. I’ve used various techniques to explore similar aesthetics: peppers ghost (used in the Tupac Coachella concert), semi transparent screens, mirrors and lenses, which are often referred to as « holograms » but are in fact cheap tricks and just 2d projections. To avoid misleading use of the word hologram (remember the heated debate with Kickstarter’s CEO about the Holus scam? ), I use the term No-logram (not a hologram). 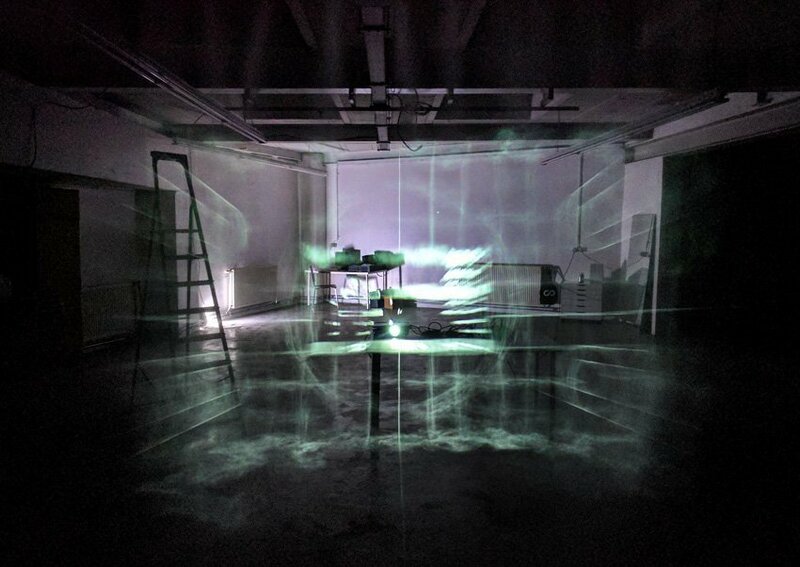 I’m now developing a technique using super fine particles of water, high pressure gaz and custom nozzles, to create true volumetric projections, and build large installations in public spaces. Technically there is no limitation in size / scale. I use common tracking technologies (depth sensor and image analysis) to allow interaction between the user/audience and the projections. My works explores geometric patterns, repetitive shapes in nature, and the similarities we can witness when looking at the structure of the universe at various scales. The volumetric projections are also a great medium to question the nature of reality, and how technology can modify our perception of the world we live in. The making of a digital panorama.